In the August 16, 2011 publication of SEARCHLIGHT, King admitted that he had called businessman Bryan Alexander concerning comments Alexander posted on Facebook which King believed referred to him. King also admitted that he had informed Alexander that he had contemplated killing him because of these comments, and on a call in radio program repeated what he had contemplated doing. He also said he prayed to God to take away these thoughts from him. Kingâs statement has drawn fire from a number of persons, some of whom have called for him to be dismissed from his post as Press Secretary. 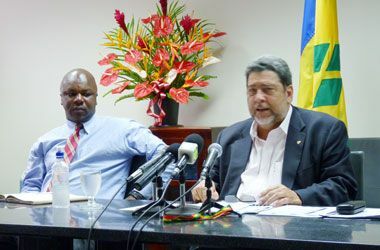 At a press conference hosted at Cabinet Room on Monday, August 29, Prime Minister Dr. Ralph Gonsalves, responding to a question from SEARCHLIGHT on the matter,s said that he had spoken to King, and indicated to him that he (Dr. Gonsalves) would not have repeated such statements in a public forum, having already spoken to the individual personally. Dr. Gonsalves said that it was his hope that the persons who are criticizing King for his statements were equally condemnatory of the actions of Alexander, which caused King to make the statements that he made. The Prime Minister dismissed notions that his decision not to comment on the matter before meant that he condones his Press Secretaryâs action. He further added that he himself does not harbour any ill feelings against those who offend him.